Emirates is one of the largest international airlines in the world serving over 160 destinations globally and operating over 210 aircraft. The U.A.E based carrier is also the largest operator of A380-800 and B777-300(ER) aircraft with over 60 A380 and 100 B77W's in service! Here at Collectable Aircraft Wings Australia we stock a diverse range of models produced exclusively for Emirates by leading brands such as Gemini Jets, Skymarks and Herpa. Models are usually produced in multiple scales including 1/200, 1/400 and 1/500 offering an extensive selection for avid collectors. Exclusively Produced for Emirates Product Description: Airline: Emirates Aircraft .. Product Description: Airline: Emirates Aircraft Type: Airbus A380-800 Registration: A6-.. 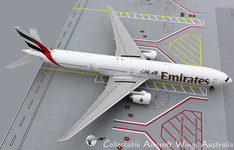 Product Description: Airline: Emirates Aircraft Type: Boeing B777-300(ER) Reg..